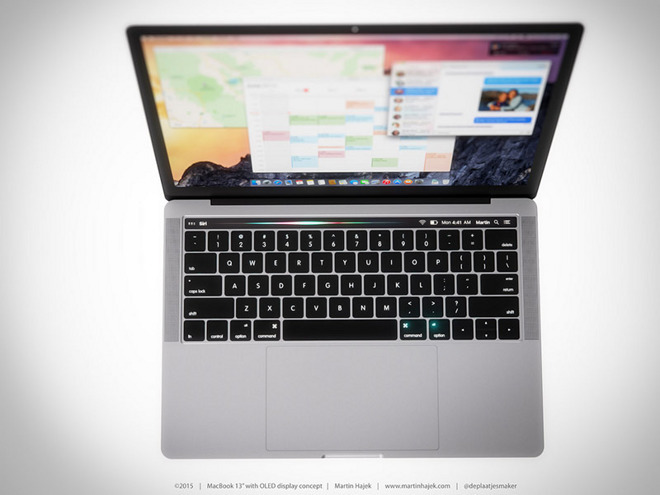 Building on a foundation of recent rumor and speculation, designer Martin Hajek mocked up computer graphics renders exploring the utility of incorporating an OLED touchbar into Apple's rumored next-generation MacBook Pro, a device anticipated for release later this year. 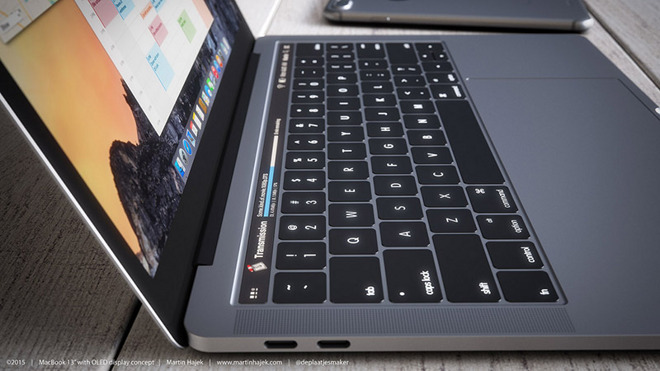 Posted to Hajek's blog on Thursday, the concept rendering integrates a sleek, high-resolution OLED touchbar into a modified MacBook Pro chassis modeled after a supposedly leaked part shown off in photographs last month. The result is nothing short of stunning. In May, well-connected KGI analyst Ming-Chi Kuo issued a note airing Apple's potential plans for its aging MacBook Pro lineup. Along with a thinner, lightweight design, Kuo said Apple will nix the top row of function keys in favor of a single OLED touch panel. As the company is unlikely to remove existing keyboard functionality, some speculate the display will double as a customizable touch input capable of reconfiguring itself on the fly. Hajek offers a few examples of how Apple might handle contextual reconfiguration. 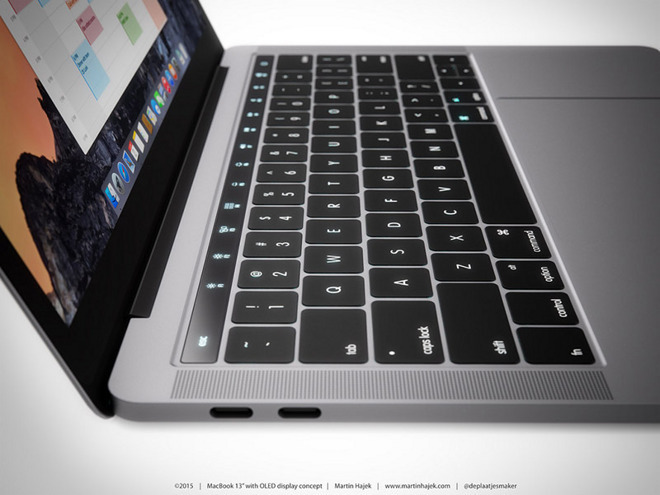 A few concepts show a representation of MacBook's traditional top row keys with the usual secondary functions like volume control, screen brightness and OS X system shortcuts. Other renders imagine the OLED display mirroring Mac's menu bar icons with app-specific graphics, an interesting idea that plays well Apple's push toward fullscreen app views. Siri's telltale equalizer graphic can be seen in another concept. Not present is a MacBook version of Touch ID. Kuo predicts the next-generation MacBook Pro will be the first non-iOS device to integrate Apple's fingerprint recognition system. As Touch ID is embedded into iPhone and iPad home buttons, some speculate MacBook Pro's power button, or its OLED facsimile, as a logical installation site. Kuo's note estimated Apple to announce a revamped MacBook Pro in the fourth quarter, but more recent rumblings suggest a June unveiling ahead of wide availability in August.